The Italian American Society of Kenosha welcomes you! The Italian American Society of Kenosha, Wisconsin was established in September of 1923 as the result of combining several previously established organizations, including the G. Giaribaldi Society, the S. Francesco Society, the S. Michele Society and the Maria SS Della Schiava. Together, these groups built the Italian-American Home, a club house where they could freely meet for entertainment and educational opportunities. Since then, the Society has continued to grow and has become an integral part of the Kenosha community, providing a center for Italian Americans to gather for fellowship, cultural exchange, education and celebrations. Our dining and banquet facilities are open to the public, and enjoy a reputation for culinary excellence! 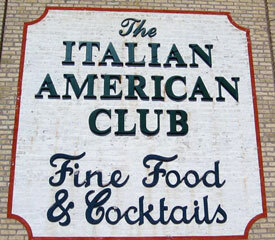 We invite you to learn more about the Italian American Society of Kenosha by visiting and enjoying our fine dining and hospitality.